Notes for the third lecture Metrical task systems on a weighted star are up. Notes for the second lecture of our course Competitive analysis via convex optimization are up: Navigating a convex body online. After not generating any new posts for a long time, I am happy to have finally switched platforms. The new site is hosted on gitpages at tcsmath.github.io. While the domain name tcsmath.org should point there, I am trying to work around well-known https certificate issues that cause Chrome to have a nervous breakdown. The motivation for switching platforms is a course I’ve just started co-teaching with Seb Bubeck on Competitive analysis via convex optimization. The notes for the first lecture are live: Regret minimization and competitive analysis. In a previous post, we saw how an entropy-optimal drift process could be used to prove the Brascamp-Lieb inequalities. Our main tool was a result of Föllmer that we now recall and justify. Afterward, we will use it to prove the Gaussian log-Sobolev inequality. where is a progressively measurable drift and such that has law . where the minima are over all processes of the form (1). thus we need only exhibit a drift achieving equality. We are left to show that has law and . We will prove the first fact using Girsanov’s theorem to argue about the change of measure between and . As in the previous post, we will argue somewhat informally using the heuristic that the law of is a Gaussian random variable in with covariance . Itô’s formula states that this heuristic is justified (see our use of the formula below). The following lemma says that, given any sample path of our process up to time , the probability that Brownian motion (without drift) would have “done the same thing” is . Remark 1 I chose to present various steps in the next proof at varying levels of formality. The arguments have the same structure as corresponding formal proofs, but I thought (perhaps naïvely) that this would be instructive. the process has the same law as . Here we are using that and is deterministic conditioned on the past, thus the law of is a normal with mean and covariance . where the last line uses . In the last line, we used the fact that is the infinitesimal transition kernel for Brownian motion. From Lemma 2, it will follow that has the law where is the law of . In particular, has the law which was our first goal. Notice that this involves both time and space derivatives. This generalizes in a straightforward way to the higher dimensional setting . where is the Laplacian on . Note that the heat equation was already contained in our “infinitesimal density” in the proof of Lemma 2, or in the representation , and Itô’s lemma was also contained in our heuristic that has covariance . giving our desired conclusion (3). where we used . Combined with (2), this completes the proof of the theorem. thus the Fisher information describes the instantaneous decay of the relative entropy of under diffusion. This expresses the intuitive fact that when the relative entropy is large, its rate of decay toward equilibrium is faster. Martingale property of the optimal drift. Now for the proof of (5). Let be the entropy-optimal process with . We need one more fact about : The optimal drift is a martingale, i.e. for . Let’s give two arguments to support this. This implies that if we condition on the endpoint , then is a Brownian bridge (i.e., a Brownian motion conditioned to start at and end at ). Argument two: Change of measure. There is a more succinct (though perhaps more opaque) way to see that is a martingale. Note that the process is a Doob martingale. But we have and we also know that is precisely the change of measure that makes into Brownian motion. The latter quantity is . In the last equality, we used the fact that is precisely the change of measure that turns into Brownian motion. As I have mentioned before, one of my favorite questions is whether the shortest-path metric on a planar graph embeds into with distortion. This is equivalent to such graphs having an -approximate multi-flow/min-cut theorem. We know that the distortion has to be at least 2. By a simple discretization and compactness argument, this is equivalent to the question of whether every simply-connected surface admits a bi-Lipschitz embedding into . In a paper of Tasos Sidiropoulos, it is proved that every simply-connected surface of non-positive curvature admits a bi-Lipschitz embedding into . A followup work of Chalopin, Chepoi, and Naves shows that actually such a surface admits an isometric emedding into . In this post, we present a simple proof of this result that was observed in conversations with Tasos a few years ago—it follows rather quickly from the most classical theorem in this setting, the Okamura-Seymour theorem. Theorem 1 Suppose that is homeomorphic to and is endowed with a geodesic metric such that has non-positive curvature. Then embeds isometrically in . We will access the non-positive curvature property through the following fact. We refer to the book Metric spaces of non-positive curvature. Lemma 2 Every geodesic in can be extended to a bi-infinite geodesic line. It is an exercise to show that the boundary of is composed of a finite number of geodesics between points . For every pair , let denote a geodesic line containing and which exists by Lemma 2. 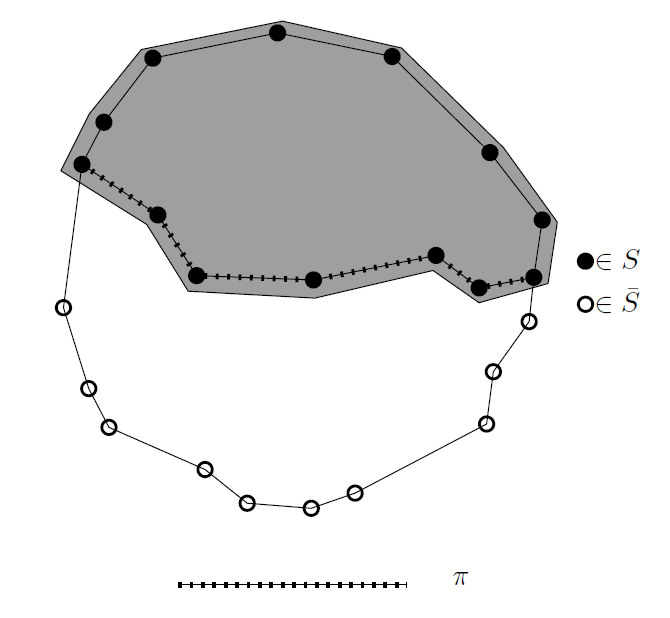 Consider the collection of sets , and let denote the set of intersection points between geodesics in . 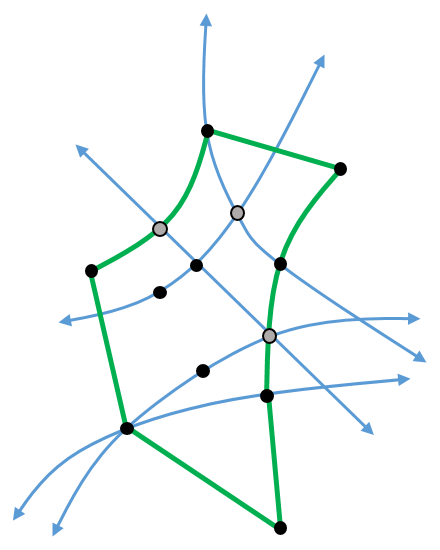 Since is a collection of geodesics, and all geodesics intersect at most once (an easy consequence of non-positive curvature), the set is finite. Consider finally the set . The geodesics in naturally endow with the structure of a planar graph , where two vertices are adjacent if they lie on a subset of some geodesic in and the portion between and does not contain any other points of . Note that is the outer face of in the natural drawing, where is the boundary of (the union of the geodesics in ). We can put a path metric on this graph by defining the length of an edge as . Let denote the induced shortest-path metric on the resulting graph. By construction, we have the following two properties. If or for some , then . For every , there is a shortest path between two vertices in such that . Both properties follow from our construction using the lines . Now let us state the geometric (dual) version of the Okamura-Seymour theorem. Theorem 3 (Okamura-Seymour dual version) For every planar graph and face , there is a -Lispchitz mapping such that is an isometry. Let us apply this theorem to our graph and face . Consider and . By property (1) above, we have . Since , from Theorem 3, we have . But property (2) above says that and lie on a – shortest-path in . Since is -Lipschitz, we conclude that it maps the whole path isometrically, thus , showing that is an isometry, and completing the proof.